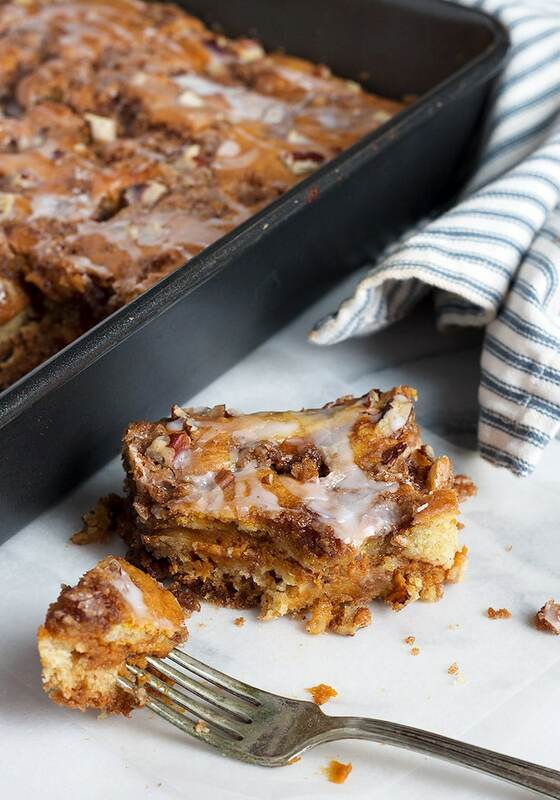 This delicious Sour Cream Pumpkin Coffee Cake is coffee cake meets pumpkin pie! 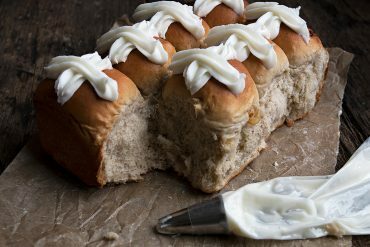 Enjoy the ribbon of pumpkin, running through a sour cream coffee cake. If you are expecting a house full for the holidays, wouldn’t it be great to have a lovely, season sweet treat on the counter for everyone to enjoy? 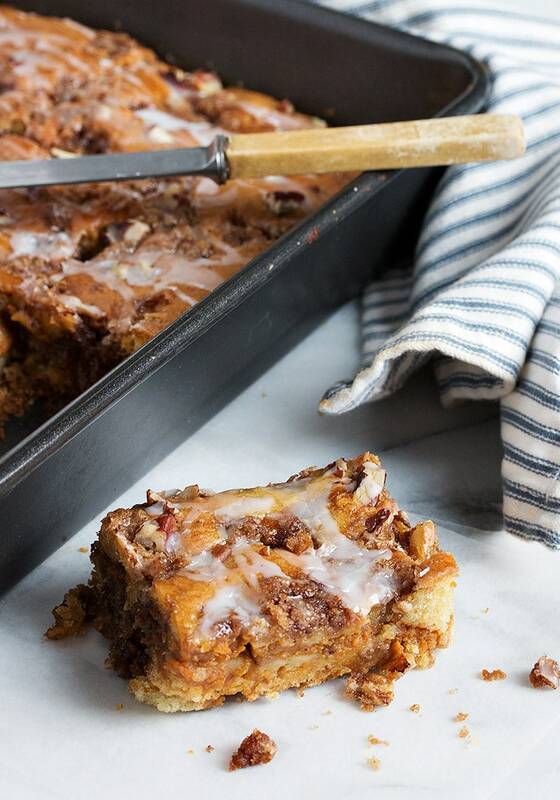 This delicious Sour Cream Pumpkin Coffee Cake fits the bill perfectly! 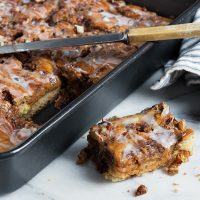 Perfect for a snack, a bite with morning or afternoon coffee, for the brunch table or even for dessert, this pumpkin coffee cake will be sure to be popular. 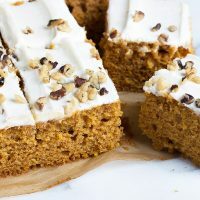 If Pumpkin Pie and Coffee Cake had a love child, it would be this Sour Cream Pumpkin Coffee Cake! 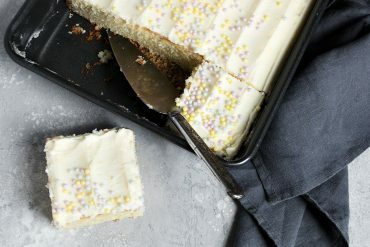 This cake bakes up in a 9×13 pan and so is perfect for feeding a crowd. 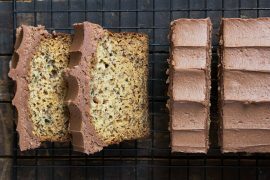 This coffee cake is quite moist, so it’s probably at its best in the first 24 hours after baking. You can store at room temperature or in the fridge (I love cold pumpkin pie, so I enjoyed this one right from the fridge). You can substitute walnuts for the pecans or leave out the nuts altogether, if you like. Top Tip! This cake comes together quickly if you make the streusel and pumpkin filling before starting the cake batter. Make them while your butter is softening for the batter, then the just mix the batter, layer in the pan and bake! This delicious sweet treat is coffee cakes meets pumpkin pie! A great holiday snacking cake or brunch table treat. Preheat the oven to 325F and grease a 9x13 baking pan. Set aside. In a medium bowl, stir together the 1 cup brown sugar and 2 tsp cinnamon. Cut in the butter with two knives or a pastry cutter. Stir in the chopped pecans. Place in the fridge until needed. In a medium bowl, stir together the pumpkin puree, 1/3 cup white sugar, egg, cinnamon, nutmeg, ginger and salt until well combined. Set aside. In a medium bowl, whisk together the flour, baking soda, baking powder and salt. Set aside. 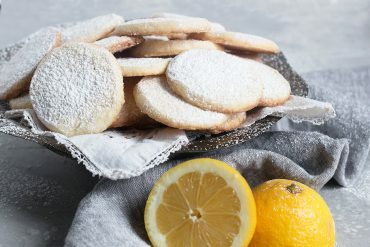 In a large bowl with an electric mixer or the bowl of a stand mixer with a paddle attachment, cream the butter with the white sugar until light and fluffy, about 2-3 minutes. Mix in the vanilla. Add the eggs one at a time, beating well after each addition. Add the dry ingredients, alternately with the sour cream and mix until combined. Spoon 1/2 of the cake batter into your prepared pan. Sprinkle with 1/2 of the streusel mixture. Spread all of the pumpkin filling over-top. Add the rest of the cake batter and spread on top of the pumpkin filling. Sprinkle the remaining streusel on top. Bake in preheated oven for 45-55 minutes or until set and golden. 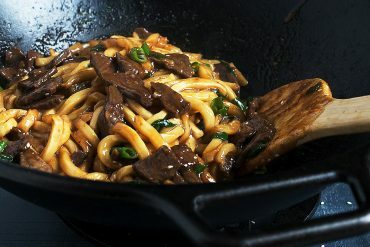 Remove to a cooling rack and cool in pan until completely cooled. 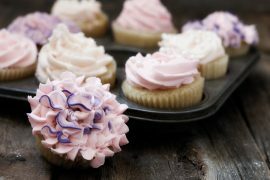 Stir together the icing sugar, milk and vanilla until you have an icing thin enough to fall from a spoon, adding more milk as necessary. 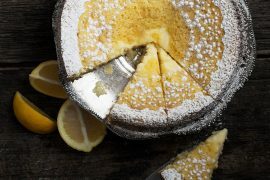 When cake is cooled, drizzle over-top. Place cake pan in fridge to set glaze. You can store the cake in the fridge or keep at room temperature, well covered. 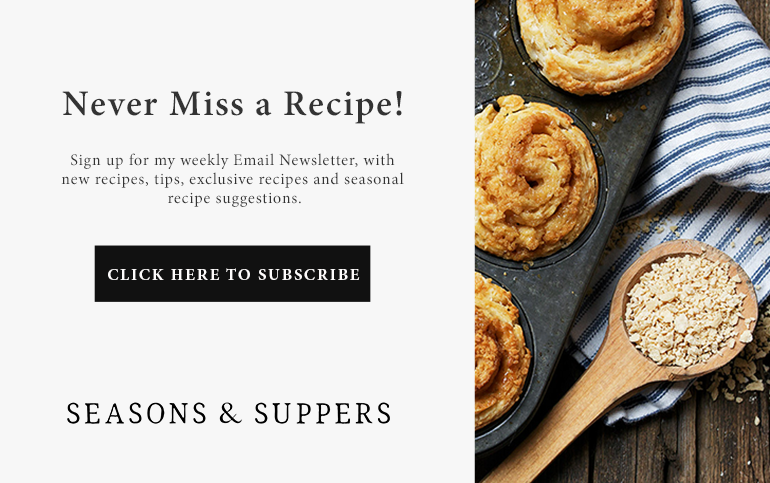 Be sure to read the "Cook's Notes" in the original post, for more tips, options, substitutions and variations for this recipe! 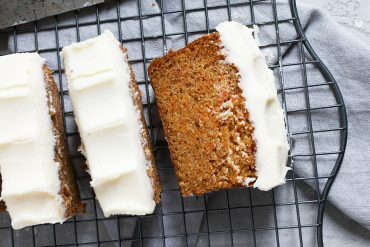 A light and moist pumpkin snack cake. 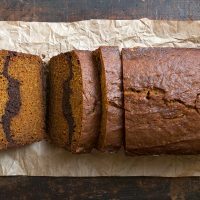 Pumpkin bread with a vein of chocolate brownie running through it. 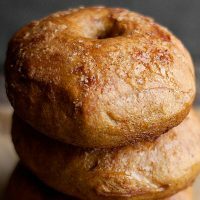 Bring a little pumpkin spice to your morning bagels. Has anyone tried it with fresh pumpkin? Assume it would just be a higher water content? You noted that this is already a little moist, so wondering if I should make adjustments. I made this coffee cake many years ago for several thanksgiving days and decided to try others different desserts and this recipe was long forgotten along with recipe book that I found it in(found in a dollar recipe book😊). Today my husband was asking how come I stopped making it and that it would be nice to have it again, I remembered the ingredients but not the amounts and what went with what. So I googled it and there was your recipe exactly how I remembered…thank you!!! Will be making one hubby very happy this turkey day! Blessings and have a very Happy Thanksgiving! I just made this one today. I adjusting myself for half of amount instead 13×9 pan to 8×8. Result was so good and moist cake !! One thing that I wanted to more adding Pumpkin taste or Spice. So I do more adding for those next time what I ‘m gonna making again. Bring on the pumpkin Jennifer! I’ve got a girl’s brunch next weekend! Can’t wait to try this! 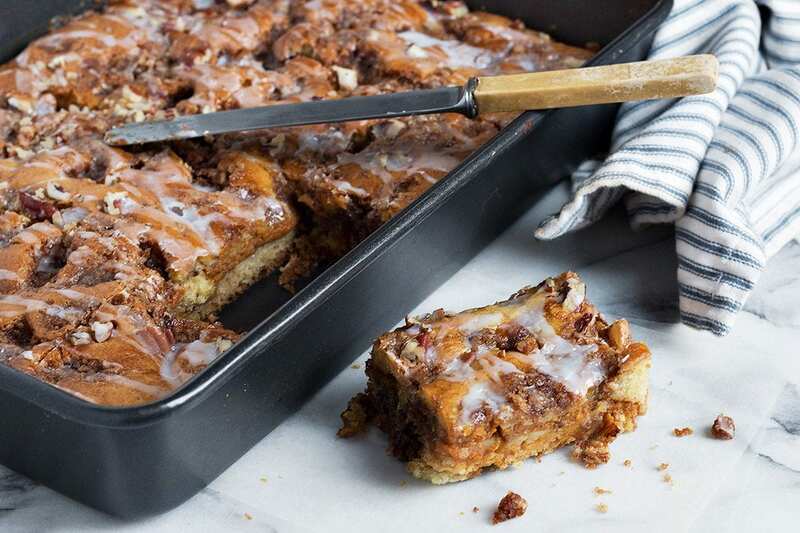 I’m a huge sucker for sour cream coffee cake and then add pumpkin streusel… Oh my! I can’t wait to try this!